Conrad Selig is here from Ft. Wayne, IN, and he’s brought a Danger! Lunalight Deck! 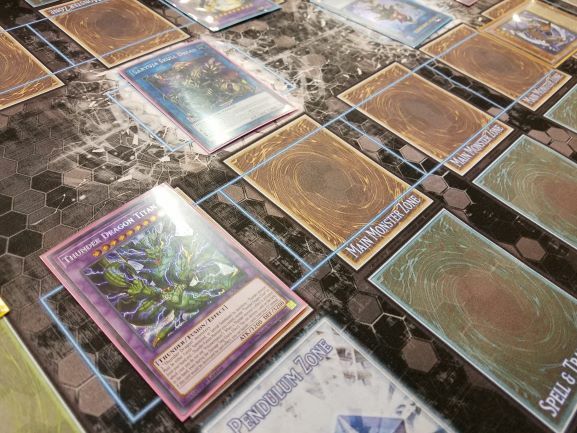 The Lunalight strategy can make some very impressive boards with Link, Xyz, and Fusion monsters, and he uses Danger! cards to bolster the strategy. 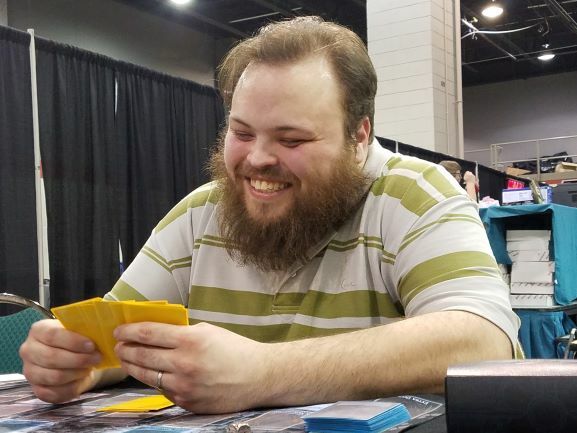 His opponent is Sonny Perrini from Columbus, OH, packing a Thunder Dragon Deck. The effect of Thunder Dragon Colossus could give him an edge in this Match, and Selig will need to find ways to play around it. Selig began with a hand of Lunalight Black Sheep, Raidraptor – Singing Lanius, Lunalight Wolf, Lunalight Yellow Marten, and Called by the Grave. He played Wolf in his Pendulum Zone, then returned Wolf to Special Summon Yellow Marten. He Normal Summoned Singing Lanius and Xyz Summoned Time Thief Redoer! He Set Called by the Grave. Selig used Redoer to steal Thunder Dragon off the top of Perrini’s Deck and attach it as an Xyz Material. Perrini played Allure of Darkness, banishing Aloof Lupine. He then Normal Summoned another Aloof Lupine, banishing Batteryman Solar to banish Thunder Dragonroar from his Deck. Dragonroar’s effect Special Summoned Thunder Dragondark from the Deck. He used Lupine and Dragondark to Link Summon Wee Witch’s Apprentice. He tried using Dragondark’s effect, and Selig flipped Called by the Grave to banish and negate it. Perrini played Gold Sarcophagus, banishing Thunder Dragonhawk. He used its effect to shuffle two cards from his hand into the Deck and draw two fresh ones. He played Instant Fusion to Fusion Summon Thousand-Eyes Restrict, and Selig used his Time Thief Redoer’s effect to banish itself until the End Phase. His Yellow Marten Xyz Material hit the Graveyard, and it added Lunalight Fusion to his hand. Perrini played yet another Fusion card: Thunder Dragon Fusion! He combined Thunder Dragon and Dragondark to play Thunder Dragon Colossus! He then used Thousand-Eyes Restrict to play Linkuriboh. Thanks to Wee Witch’s Apprentice, his monsters were powered up – he attacked with Colossus, Witch, and Linkuriboh to leave Selig with 2200 Life Points. In the End Phase, Time Thief Redoer returned to the field. Selig drew Luna Light Perfume, and used Redoer to attach Instant Fusion from Perrini’s Deck. He used Redoer’s effect to draw Lunalight Emerald Bird. He Normal Summoned it, discarding Black Sheep to draw Lunalight Tiger. The Perfume came next, bringing Yellow Marten to the field. He used both Lunalights and Redoer to play The Phantom Knights of Rusty Bardiche. Rusty Bardiche sent The Phantom Knights of Silent Boots to the Graveyard to Set The Phantom Knights of Shade Brigandine on the field. He played Tiger in his back row, which revived Emerald Bird. He bounced the Tiger to Special Summon Yellow Marten. He used the Lunalights to play Brotherhood of the Fire Fist – Tiger King, which Set Fire Formation – Tenki. He then used Tiger King’s effect, detaching Yellow Marten to negate Perrini’s monsters. He played Lunalight Tiger again, which Special Summoned Yellow Marten. He used it and Tiger King to play Underclock Taker. He played Lunalight Wolf in his Pendulum Zone. Now that Thunder Dragon Colossus was negated, Selig flipped up Tenki and added Lunalight Kaleido Chick to his hand. Using Lunalight Wolf, he banished Yellow Marten, Emerald Bird, and Black Sheep from the Graveyard to play Lunalight Sabre Dancer! He then used Silent Boots to get The Phantom Knights’ Rank-Up-Magic Launch. He had Underclock Taker drop Colossus to 0 ATK and sent Sabre Dancer to wipe it out! Rusty Bardiche destroyed Wee Witch’s Apprentice, which added Aloof Lupine to the hand. Underclock Taker attacked directly, leaving Perrini with 1400 Life Points. Perrini banished Thunder Dragon Fusion from his Graveyard to add Thunder Dragonroar to his hand. He played Aloof Lupine and banished Dragonroar from his hand and Dragondark from his Deck. He used both of their effects, adding Thunder Dragon to his hand and Special Summoning Thunder Dragonmatrix. He used the effect of Thunder Dragon to add one copy to his hand. Then, he Tributed Dragonmatrix to play Thunder Dragon Colossus, and Dragonmatrix added another copy of Dragonmatrix to his hand. He then banished Dragonmatrix and Colossus to play Thunder Dragon Titan! It attacked Underclock Taker for exactly the 2200 damage Perrini needed to take the first Duel! Selig began the second Duel with Called by the Grave, Lunalight Black Sheep, Lunalight Yellow Marten, Lunalight Tiger, and Foolish Burial Goods. He started off with Foolish Burial Goods to put Lunalight Serenade Dance in the Graveyard, and banished it send Yellow Marten to the Graveyard and Special Summon Lunalight Kaleido Chick. Yellow Marten added Lunalight Fusion to his hand. He used Kaleido Chick to send Lunalight Wolf to the Graveyard. He used Black Sheep’s effect to add the Wolf to his hand. He played Tiger and had it Special Summon Yellow Marten. He used Yellow Marten and Kaleido Chick to Link Summon Fire Fighting Daruma Doll. He bounced Tiger back to his hand to Special Summon Yellow Marten from the Graveyard, and activated Tiger again to Special Summon Kaleido Chick. He used Yellow Marten and Daruma Doll to play Summon Sorceress, and it Special Summoned another Kaleido Chick. 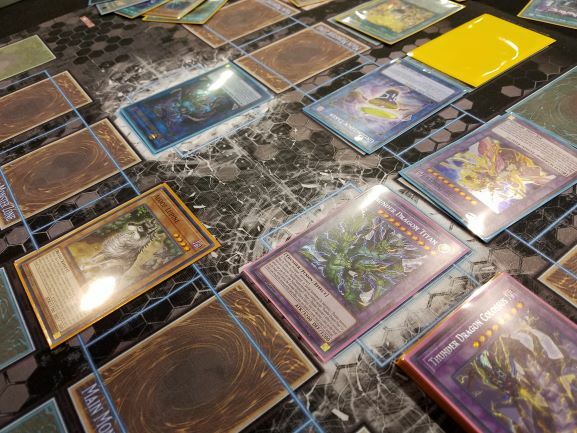 He used both Kaleido Chick effects to send Lunalight Emerald Bird and Lunalight Panther Dancer to the Graveyard (the Chicks’ effects were negated but the cost can still be paid). He used both Chicks to play Tiger King which Set Fire Formation – Tenki on the field. He flipped it to get a new Lunalight Tiger. He activated Lunalight Wolf and Fusion Summoned Lunalight Leo Dancer! He Set Called by the Grave and passed his turn with an impressive field of Summon Sorceress, Tiger King, and Leo Dancer! Perrini played Batteryman Solar to send Dragonroar to the Graveyard. He banished Dragonroar to Special Summon White Dragon Wyverburster, then Dragonroar Special Summoned Dragondark. He used Solar’s effect to Special Summon a Batteryman Token. He used all four of his monsters to Link Summon Saryuja Skull Dread! Wyverbuster and Dragondark added Black Dragon Collapserpent and Thunder Dragonhawk to his hand with their effects. Then, Skull Dread let him draw four cards and return three to his Deck. He activated Thunder Dragon from his hand, adding one copy to his hand. He used Skull Dread to Special Summon Dragonroar from his hand and Tributed it for Thunder Dragon Colossus. He Special Summoned Collapserpent by banishing Thunder Dragon. He then banished Colossus and the Dragonhawk from his hand to play Thunder Dragon Titan. He activated Thunder Dragon from his hand, and Selig used Called by the Grave to negate it. At this point the round timer ended, with both Duelists at 8000 Life Points. That put this Duel as a draw (Perrini could also have attacked for some damage in the Battle Phase if he had moved to the next Phase with his Colossus earlier). As Perrini had won the first Duel, that put him as the winner of the Match. 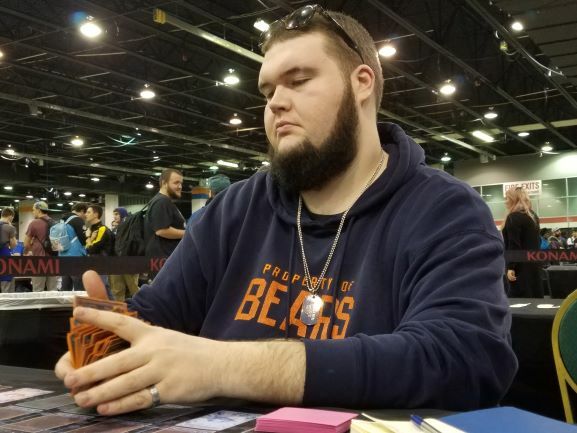 Conrad Selig played a close first Duel but it just ate up too much time, leaving him unable to even things up in the second Duel after his great opening. Congrats to Sonny Perrini for taking it with Thunder Dragons!